Fewer than thirty percent of people who suffer what is called a “widowmaker” heart attack–a complete blockage of one of the main arteries bringing blood to the heart–survive. There are no statistics on the survival rate for those who suffer a widowmaker while sitting in a rowing shell in the middle of a lake. 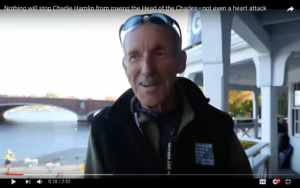 Charlie Hamlin, 1968 Olympian, former executive director of the National Rowing Foundation, and one of the most decorated masters athletes in history, may indeed be the only one. But three months after his heart attack he is back at the Head of the Charles, happy to see old friends, and expecting them to defend their title in in the 60-plus Grand Master Eights on Saturday morning. CLICK HERE to hear him tell his story.